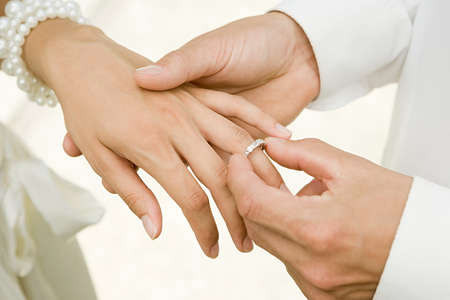 Getting married is one of the most significant steps in anyone’s life. Two people make vows to each other to remain exclusively together for the rest of their lives, “for better for worse, for richer for poorer, in sickness and in health,” until death. Here at St Bernadette’s we want to help make your wedding day as perfect as possible. Please get in touch for more details about how we can help. As Catholics we believe that marriage is at the heart of God’s plan of us. The Bible tells us how God created the first man and woman, Adam and Eve, and gave them the gift of marriage, commanding them to ‘go forth and multiply’. Jesus himself blessed the couple at Cana on their wedding day with one of his first miracles. He also said that what God has joined together no one should divide. These Bible passages help us understand that Marriage is sacred and that God intends it to be a source of new life, with the gift of children. It is because the Church attaches such importance to marriage, both for the couple themselves and for society as a whole, that she is concerned that couples intending to marry are adequately prepared, and understand what it is to which they are committing. At St Bernadette’s we offer, through Marriage Care, a one day course to help couples, planning to marry in a Catholic Church, prepare for fulfilled and happy relationships.